For auto enthusiasts in the US, you’re probably aware of the steady decline of the manual transmission. 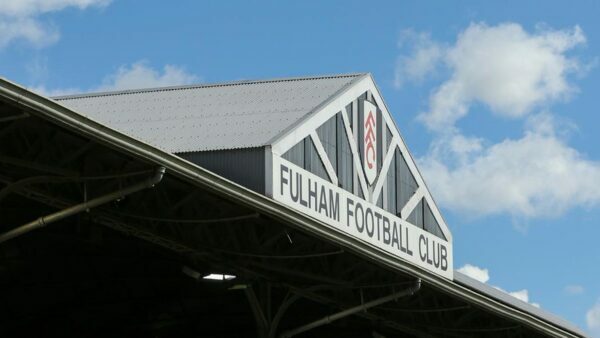 Just how much of a downturn is a bit of an eye-opener though, especially when it comes to the used market. Despite the shrinking market, there are still a few bastions of hope for manual-lovers across the states. 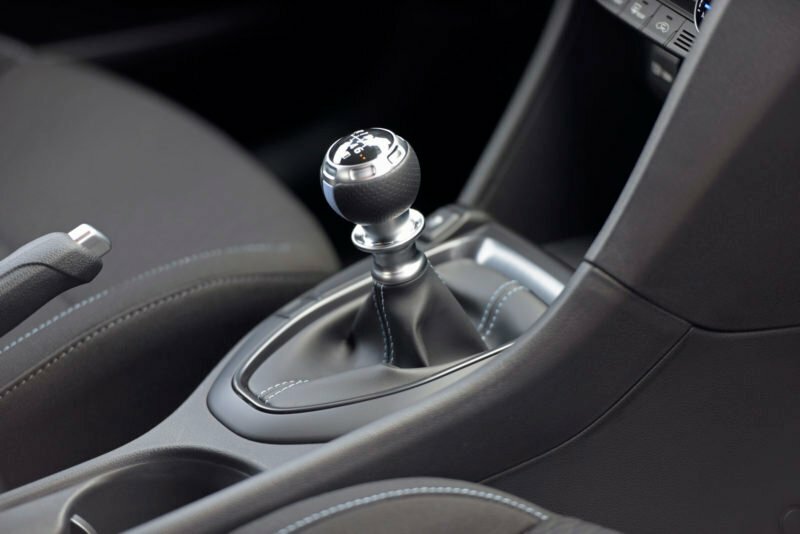 So where should you look if you want a manual transmission vehicle? 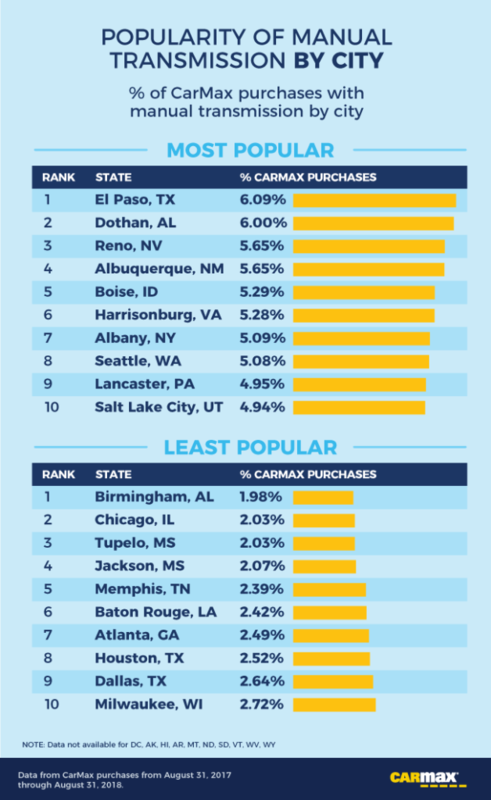 According to a recent report by CarMax, the Western US. 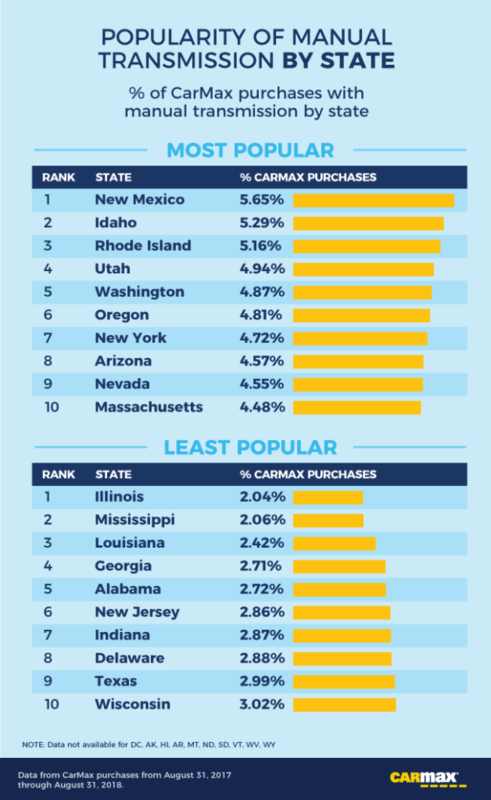 Topping CarMax’s list of findings is New Mexico, followed closely by Idaho. Rhode Island comes in at third as the first East Coast state. But, it’s then followed by places like Utah, Washington, and Oregon. Of the top 10, only three East Coast states make the cut. Along with Rhode Island, New York comes in at seventh and Massachusetts sneaks in at number 10. If you really want a manual though, the best place to go is El Paso, Texas. 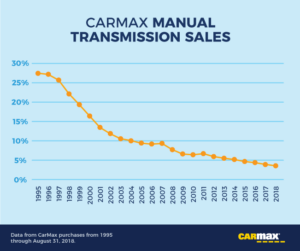 Per CarMax, 6.09% of all vehicle sold are manuals. Not surprisingly, the bottom 10 are mostly Eastern, primarily in the Southeast. Illinois tops the list though with only 2.04% of CarMax sales being a manual vehicle. This is probably helped by Chicago’s low manual buying population that makes up just 2.03% of CarMax Sale. The worst city for finding a manual? Birmingham, Alabama. This begs the question, why are manuals more prevalent in the Western US? CarMax didn’t give any indication in its study, but we do have some thoughts. For instance, New Mexico contains huge tracts of wilderness. From expansive high deserts to towering mesas, there’s not much around. This leaves plenty of room for outdoor activities that require 4WD vehicles. Thankfully, for manual enthusiasts, many of those 4WD vehicles have manual options. Or at the very least had a manual option at one time. These are things like the Subaru WRX, Jeep Wrangler, Toyota Tacoma and FJ Cruiser, and Nissan Xterra. It’s not all about off-road driving either. These Western states also have plenty of paved roads that snake through canyons or mountain passes ripe with switchbacks. This is the perfect environment for spirited drivers looking for some fun. Thankfully, most of these cars also come with manual options. States like Idaho, Washington, and Oregon are all along a similar vein. We also have some first-hand experience with Utah and just how rugged it is. Another thing that potentially contributes to auto buyers gravitating towards a manual in these states is population. New Mexico ranks just 36th in total population with a little over two million residents. Idaho is even lower with 1.7 million and Utah is a bit higher with 3.1 million. With fewer residents, it means smaller cities and thus less traffic on the roads. When you don’t need to sit in rush hour traffic for hours, the chore of driving a manual decreases. This means those who want one are more likely to buy one. The number of buyers who want a manual is pretty small though. According to CarFax, back in 1995 over 25% of its vehicles were sold with a manual. Today it’s just 3.7% and decreases every year. So why is this? 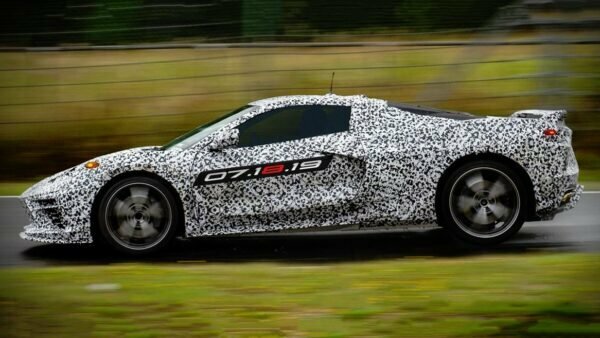 For starters, an automatic transmission in 2018 is light years better than one from 1995. If you ever had the displeasure of driving an automatic econobox from the early 90s you know what we’re talking about. 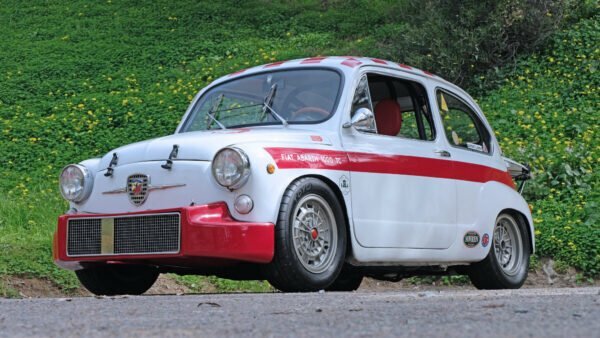 They had, at most, four gears, shift times were measured on a calendar, and they robbed a car of fuel economy. Today, it’s a different story. Shift times are quicker and on a double-clutch box, they can be impossible for a human to match. The standard gear set now has at least five speeds (other than the terrible Dodge Journey) but more and more are venturing into the eight or 10 speeds. Finally, the fuel economy advantage of a manual is no longer there and in some cases, the manual is actually worse. Performance numbers are almost always better with a modern automatic too. 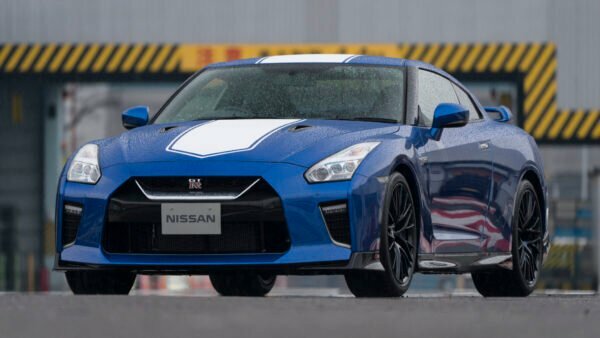 They venture to 60mph quicker, tear up the quarter mile in less time, and sometimes even have higher top speeds. While in the real world this means very little, in the marketing world it’s worth its weight in gold. If Company A can claim a tenth-of-a-second to 60 advantage over Company B, it will tout it. Same goes for automotive journalists who eat these figures up too. The cost advantage of a manual is no longer around either. Ten or fifteen years ago, you could spend upwards of $2,500 for an automatic option. That number is nearer the $1,000 range now, which is more justifiable for some buyers. All that said, it’s not like car buyers are afraid to spend money on options. 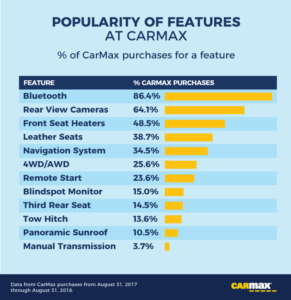 As part of its study, CarMax also looked at other options buyers wanted on their cars. Topping that list is, unsurprisingly, Bluetooth. 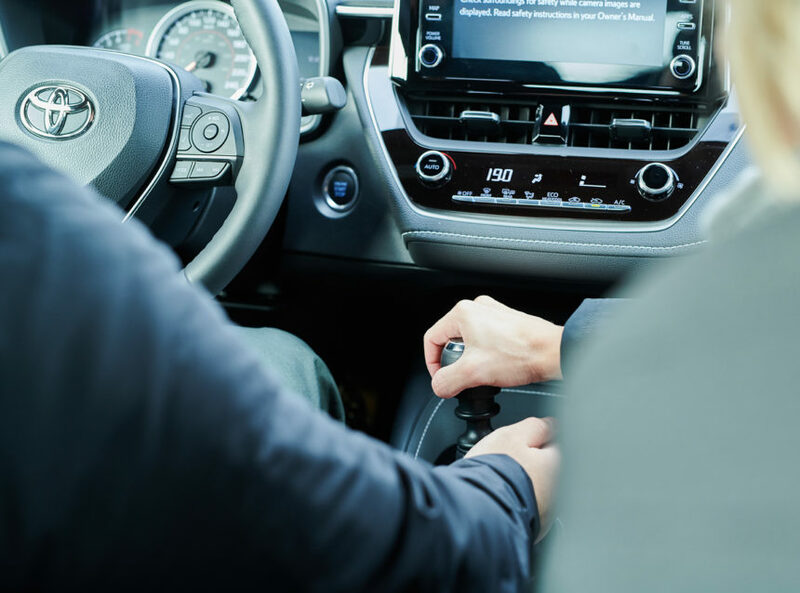 Nearly every vehicle in the last ten years comes with a Bluetooth enabled radio or at the very least a hands-free mobile phone system. In second place is a rear view camera, which is also not all that surprising. In 2007, Congress enacted the Cameron Gulbransen Kids Transportation Safety Act which mandated rearview cameras. It was a rocky road, but as of May 2018, all new cars are required to have this system. Third place is where we see an actual option pop-up, heated front seats. 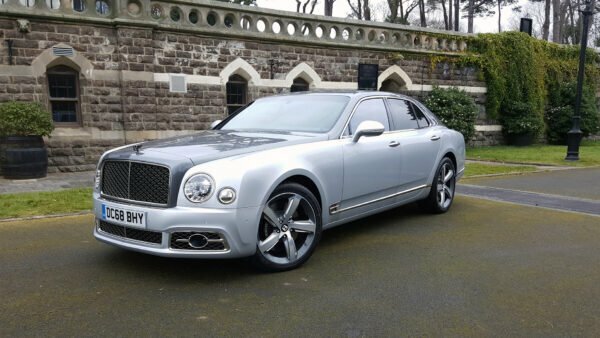 This is closely followed by leather seats, which also make sense considering these tend to go hand-in-hand. If all this news is a bit disheartening to you, there are a few things you can do. For starters, if you truly want to save the manuals, the only way that makes any difference is buy a brand new vehicle with a manual. Unfortunately, this gets harder every year as more and more brands drop manuals from the US lineup. But there are still a handful of cars out there where you can row your own. Recently, we took a look at the 2019 Toyota Corolla Hatchback. This is a perfect example of an affordable car, that looks good, and comes with a manual gearbox. It’s also loaded with cool tech, including a rather slick Intelligent Manual system that removes some of the manual pain points. We’ll have a review of the little Toyota next week, so stay tuned. The Corolla isn’t the only average vehicle to come with a manual either. 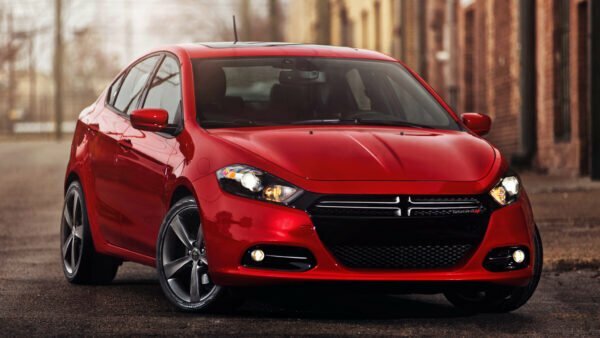 The VW Jetta, Mazda 3 (including the pretty new one), Chevy Cruze, and Hyundai Elantra all come with manual options. Once you get out the average vehicles, manuals are even more prevalent. 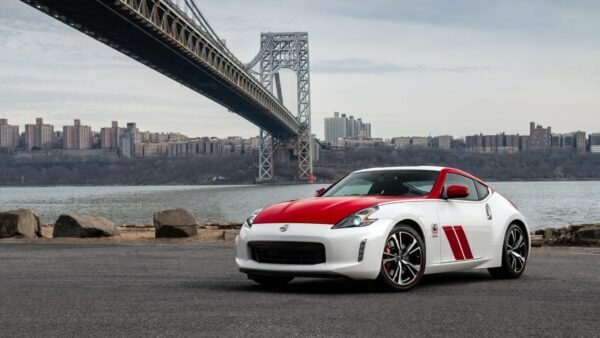 Sports cars, like the Mazda Miata and Ford Mustang, are the obvious additions to the list. There are also a smattering of hot hatches like the Hyundai Veloster N and Honda Civic Type R that offer manuals. If you want to venture off road you’re not short on choice either. The Jeep Wrangler and the new Jeep Gladiator both come with manual options. You can also snag a Chevy Colorado or Toyota Tacoma in a manual if you check the right trim box as well. Finally, and rather weirdly, the RAM 2500/3500 make the list too. Unfortunately, buying a used manual transmission vehicle will do nothing to save the manuals. Companies only want to see where they are making money and cater to demands. If enough people want a manual minivan, someone will build it, but without a market, you’ll continue to see manual options fade away. The other way to help with the #SaveTheManual campaign is to teach others. Many people don’t drive a manual because they simply don’t know how or know anyone to teach them. Even if they do know someone with a manual, there’s a possibility they won’t teach them, since clutches are expensive. But the only way to get people interested in manuals is to let them experience them. They will almost always be terrible from the get-go, so bear that in mind. It’s an easy enough skill to pick up that, with a little practice, they’ll be decent enough in no time. Granted, not everyone who learns how to drive a manual will want one. But there is still a chance you’ll convert a few. At the very worst, if manual transmissions completely disappear, we’ll always have sim racing.